(Natually, I turned to Google to learn more, and discovered that this poem is entitled "To A Louse, On Seeing One on a Lady's Bonnet at Church," and was written in 1786.) I think Burns' poems are remarkably vital and compelling. Any fellow fans out there? After the dustman's compliment, all others are insipid. I meant to say "cherished for many years." This is what happens when I work a full day and try to write coherently past midnight . . .
Duchess Lylia wrote: I meant to say "cherished for many years." I've been there....It's not fun. I am an ardent fan of Burns and have been since childhood. I love My Love is Like a Red, Red Rose. Here are some posts about the background of the poem "Highland Mary." Although painted circa 1881 by which time he was living in London, Archer looks back to his Scottish history and takes an incident in the life of Scotland's most celebrated poet Robert Burns (1759-1796) as the subject for this painting. Burns' great love was Jean Armour, the daughter of a master-mason, whom he eventually married. Their courtship, however, was tempestuous and in the spring of 1786, after Jean had destroyed the document that testified to their commitment to marry upon discovering she was pregnant by him, she was sent off to Paisley to stay with relatives and avoid scandal. Burns went into hiding and turned for consolation to another girl, Mary Campbell, whom he called his 'Highland Mary'. She was a dairymaid at Coilsfield, an estate near the village of Mauchline in Ayrshire. Despite meeting at Failford on 14 May 1786 and pledging to marry, the episode came to nothing as Mary died of a fever at Greenock shortly afterwards. This subject is also treated by W.H. Midwood in 1864 in which Burns exchanged Bibles with 'Highland Mary' over a running stream at Failford - a Scottish custom which signified betrothal. 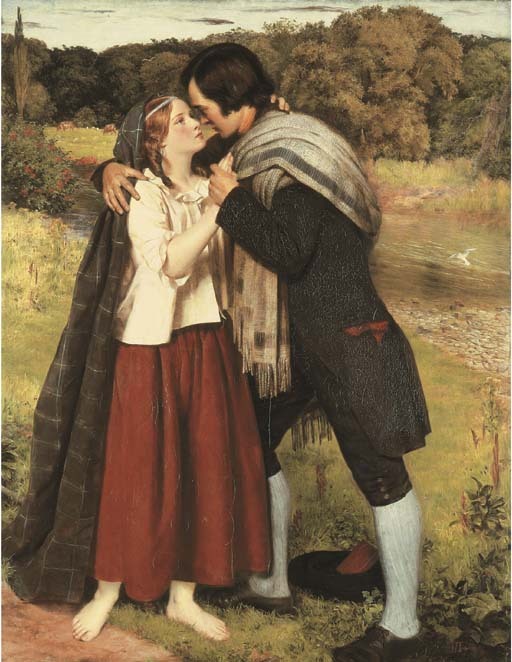 In the present picture a Bible can be seen in the cap on the ground beneath Burns' feet and the river Ayr is behind the couple. The two-volume Bible Burns gave Mary Campbell is preserved in the Burns' Museum at Alloway.